As we near the holiday season, airport travel is going to spike, typically causing added anxiety for passengers. However, as technology continually advances, airports can utilize various solutions to help alleviate some of the major pain points of traveling – such as navigating a crowded and confusing airport, printing boarding passes, and more. 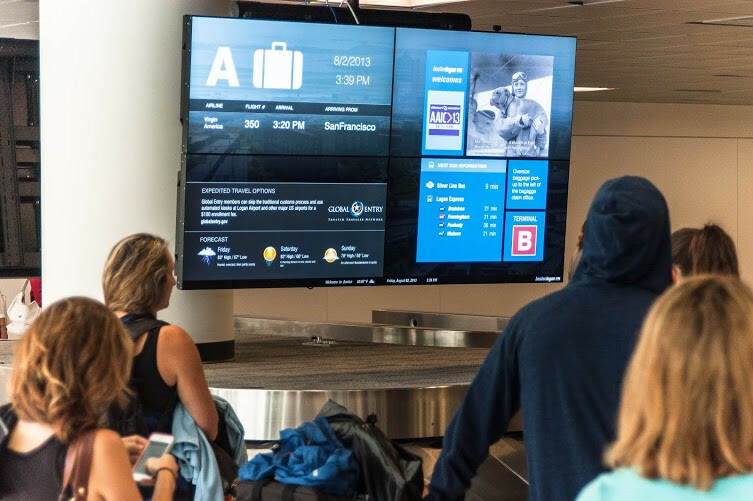 Implementing digital signage is one surefire way to simplify the passenger experience. Through the use of digital solutions, airports can share updated and accurate flight information, provide interactive mapping for wayfinding, and reduce perceived wait times for customers with shared entertainment. Interactive, self-serve kiosks can also allow users to check themselves in, print tickets, and locate facilities. By empowering the passenger, these interactive solutions can also reduce staffing and operational costs. Airports often experience heavy levels of foot traffic, specifically in entryways, security lines, and boarding areas. It can be difficult to grasp the passenger’s attention with so many activities occurring at the same time, but these are also great places to share pertinent information. Digital signage displays offer the opportunity to constantly change content, and provide an eye-catching element that static signage simply cannot do. In addition to helping travelers stay informed, digital signage in airport settings can also benefit retailers, as ad options are endless with digital signage. Airports house a plethora of vendors and shops, including food and drink stands, restaurants, gift shops, apparel stores, and more. In utilizing digital signage, retailers have the ability to display multiple ads on one display and the opportunity to reach many different audiences. Digital signage also reduces operational costs in that static signage needs to be continually printed, hung, and taken down again and again – digital signage can instantly be changed to reflect new sales and promotions. Beyond the vast benefits of integrated digital solutions in airport settings, it’s important to understand the qualifications and requirements that go into this type of product – specifically ADA compliance. The Americans with Disabilities Act (ADA) was passed in 1990 in order to prohibit discrimination and ensure equal access and opportunity for those with mental and physical disabilities in the areas of employment, public entities, public accommodations, commercial facilities, telecommunications, and more. Also, in 2010, additional provisional regulations were added to review the area of Accessible design – to ensure that public spaces have, among other accessibility features, clear pathways and curbed ramps. What does this mean for airports? For airport settings, these laws impact the planning of digital signage applications in various ways. For instance there are restrictions surrounding how far a video wall can extend from the wall, as well as how low they can hang. There are also guidelines when it comes to touch-enabled solutions and accessibility. Video Walls: Video walls that are between 27″ and 80″ off of the floor must be less than 4″ off of the wall to allow for the visually impaired to safely, and easily walk past. Before slim and sleek displays were available, large and bulky displays made this regulation a bit more complicated. Many times integrators were tasked with recessing the display into the wall, which can take quite a bit of time and is costly. With the introduction of slimmer and lighter displays, like Samsung’s commercial display units that measures about 2″ or less in depth, integrations are much easier. Used alongside mounts that offer easy installation and maintenance, like the Peerless-AV SmartMount® Full-Service Thin Video Wall Mount, it is much easier to meet ADA compliance. Kiosks / Interactive Digital Displays: ADA regulations also apply to the construction and functionality of digital signage kiosks. If a device has touch screen features, the maximum touch point cannot exceed 48″, with a max reach of 10″. A reach larger than this requires a shorter kiosk. With enhanced technology, integrating ADA-compliant kiosks has become easier. Advanced IR sensors are used to determine height and cater the placement of touch items on displays in accordance with ADA regulations. For devices that offer payment functions, the ADA guidelines require that the numeric keys have a raised dot on the “5” key, and that the function keys visually pop out from the background. In any project, whether it’s for an airport install or elsewhere, it’s important to understand the cost implications that different solutions will incur. While it may be appealing to select a display at a lower price point, the result can be added maintenance and servicing fees, as well as needing a totally new, replacement unit. Another point to consider is, how accessible is your display? Is it easily reachable on the wall, or is it on a high ceiling? Can the software be remotely updated? All these considerations will impact the total operational cost. Placement and product both have to be considered when implementing new digital signage. Energy consumption of the display will also impact the overall operational cost – will the display be powered by an LED or LCD display? LCD displays, which utilize the light modulating properties of crystals, do indeed use less energy than traditional tube displays. However, by moving to LED displays rather than LCD displays, airports can find anywhere from a 30%-60% reduction in energy and power consumption. This can be a huge savings for applications with multiple displays. Technology has become an integral part of most consumers’ every day life, helping to solve and alleviate life’s issues, and the opportunities for airports are endless. Digital signage can provide personalized guest services like wayfinding and ticketing information, while simultaneously helping to market retailers within the terminals. Along with the endless opportunities that digital signage offers, installers have to be conscious that the display meets the needs of all air passengers. By keeping ADA compliance regulations in mind, digital signage applications can accommodate all users and enhance the travel experience.